← Game 10: Sluggers vs. Sluggers – Sluggers Win!! The 2011 season has come to an end and the Sluggers have had a pretty good year. It took a little while but we finally got the rankings from the league. – and the tournament is only a few days away. Speaking of the tournament our first game is on Tuesday against Lil Divas. 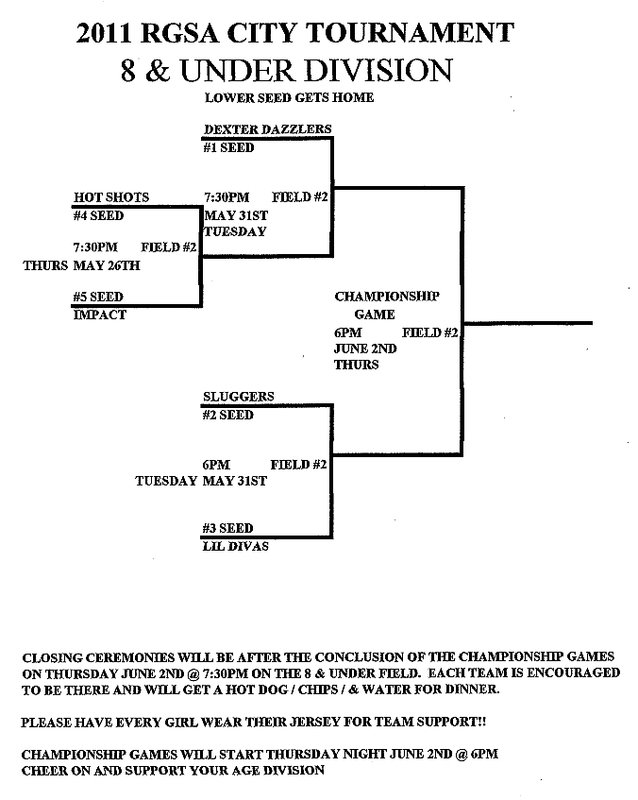 Here is the bracket rundown for this coming week. This entry was posted in softball and tagged 8U Softball Team, girls softball, Leagues, little league, RGSA, Roswell, roswell girls softball league, Sports, Youth. Bookmark the permalink.